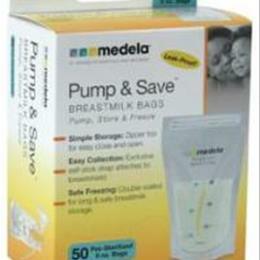 Pump & Save™ Bags - 50 pack Model: 87034 Features and Benefits Pump & Save breastmilk bags are designed with a double layer to minimize oxygen exposure and protect breastmilk for long-term storage. Pre-sterilized 5oz breastmilk bags. No-leak, easy-to-close zipper top. No-spill, stand-up bottom. Exclusive self-stick strap attaches directly to breastshield for fast and easy setup.